Moon Beam01263 715779work01603 870304fax Self-cateringThis first class accommodation offers modern utilities and comfortable furniture yet the property still retains it's original character and charm. Guests can relax with ease in this beautifully secluded area of the Norfolk countryside. The nearest beach is less than ten miles away and there is a great selection of walks to take and pubs and restaurants to visit. Pretty front view, with gravelled pathway, picket fencing and small tree. Moon Beam offers weekly bookings starting on Saturday. This first class accommodation offers modern utilities and comfortable furniture yet the property still retains it's original character and charm. 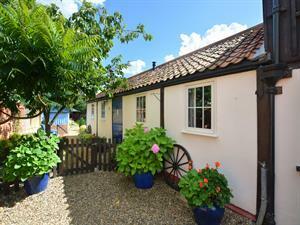 Guests can relax with ease in this beautifully secluded area of the Norfolk countryside. The nearest beach is less than ten miles away and there is a great selection of walks to take and pubs and restaurants to visit.